As May draws to a close we had another nice warm day. Passenger numbers were reasonable for a midweek service. Trains are running again tomorrow too with it being half term. Down the yard, the Mk2 TSO had a fitness to run examination ahead of the season and BSK 35006 had the final door hung as we get closer to this coach entering service too. The BSK(K) fresh gleaming from the works was tidied and readied to enter service this coming Tuesday. Work continued on trying to get 31601 running but with some sort of earth fault manifesting itself late in the day, it hadn't been run up as I left. Another warm and sunny day which saw steam in the valley once again. Passenger numbers were on a very good par with yesterday, if not a twinge higher! The Catering Department were busy once again, putting on an Afternoon Tea for 31 guests and the Miniature Railway reported another good day. Even the crew on the incline reported that they had done a good number of trips. More of the same tomorrow hopefully! Steam was the name of the game today with steam traction staring on the Wirksworth to Duffield line, Ravenstor line and miniature railway. The uncharacteristic warm and sunny bank holiday weather ensured we had many visitors. Our first service was a 09:30 trip to Ravenstor with a local scout pack. Unfortunately our visiting Jinty had a leaking washout plug and was deemed not fit to run. Rob fired up the 08 and shunted the stock into platform two and then started to prepare the Class 33 to haul the first Duffield service. Thankfully when the Jinty's boiler pressure was sufficiently low the offending plug was tightened and the Jinty was good to go. This had resulted in a 15-20 minute delay in departure from Duffield and the crew were unable to make up any time and the subsequent Duffield services ran late. Tat Wirksworth the Station Cafe played host to a party of guests as did the on train Buffett which swelled our numbers and we had very good loadings on all steam services throughout the day. The miniature railway had its busiest day of the year carrying some seventy passengers! Down the yard work continued on the Duke and the BSK and Richard was gainfully employed taking visitors on his popular yard tours.The Ravenstor service was in demand too with footplate and brake van rides. Interestingly we welcomed Chris Richardson as footplate crew on the incline service. Chris is an experienced fireman and driver previously at Peak Rail and teamed up with Mike Ball on the footplate. Chris taught Mike to drive when Mike was a volunteer 'over the hill'. My thanks to everyone who gave up their bank holiday Saturday to ensure our visitors had an enjoyable day. It was all about Bank Holiday weekend preparation today as the coaching stock was cleaned and Jinty 47406 was fired up and tested around the yard. All seems to be well! We hosted a Bronze Drive a Diesel Experience which seemed to have a gang of very happy participants at the end of the day. They sampled Iris this morning and after lunch in the Station café, the Class 33. Work began in earnest to return 31601 to service with the aim of running the engine the first priority. There wasn't enough time in the day to achieve that today but hopefully it won't be far away. Plenty of activity around the site today as a rake of coaching stock was created and brought down to the platform ready for the weekend and the marquee was put up for the summer, albeit in a new location. The S&T gang were at Shottle fettling up with ground frames and the PW team were also preparing for their next tasks in the coming weeks. A lino contractor came to fit the flooring in the BSK(K). Right at the end of the day we waved goodbye to the W&M railbus as it begin the journey back to the Ribble. A most popular visitor during it's short stay. Another glorious day for Multiple Memories. 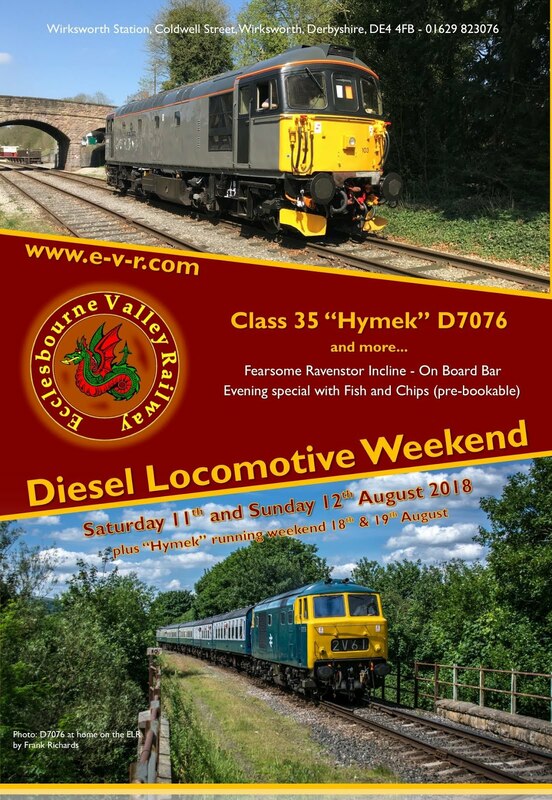 It is tradition that the Sunday isn't as busy as the Saturday in most enthusiast events and this one was no exception but happily the weekend has finished around 15% better than the same event last year. This is a pleasing result considering everything that has been going on around and about this weekend. The railbus continued to be popular today and it performed well. Sadly it is leaving us this coming week already though. These weekends take a large number of staff who have to put in a large amount of effort. Without them it wouldn't be possible so thank you to everyone who helped out this weekend. In stark contrast to the freezing temperatures and snow we had at our last gala, today was a beautifully sunny and warm day. Multiple Memories is a firm favourite in the calendar as we operate our fleet of first generation railcars in many interesting and unusual combinations for the enthusiasts. 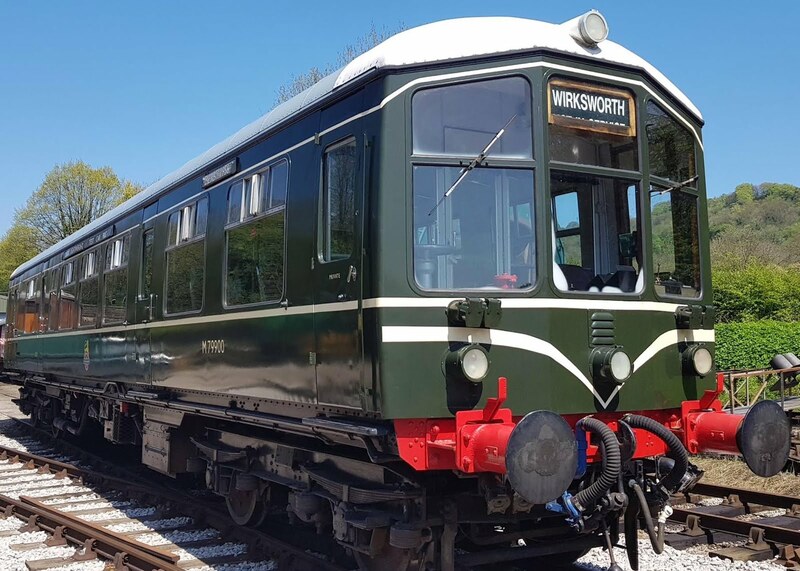 This year we have hired in the rather quirky and fun Waggon und Maschinenbau railbus E79960, on long term loan to the Ribble Railway but owned by the North Norfolk Railway. Despite a few hiccups late last night and early this morning which were ably dealt with by the team, the vehicle operated all day for the delight of our visitors. It isn't the most capacious of vehicles and it was certainly rammed all day. It is a rather unusual unit, totally different from all of our others as it features air brakes, disc brakes, a Busseng engine, 6 speed gearbox and you drive it with your feet like a road vehicle! 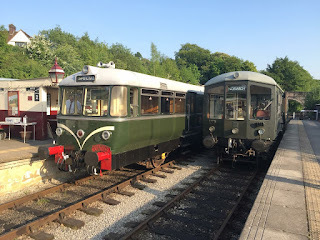 There were 10 departures from Wirksworth today starting at 09:15 and finishing with the evening run on the railbus at 19:15. The journey back watching the sunset through the panoramic windows was magnificent. A slightly different timetable again tomorrow which sees further combinations of DMUs for you to enjoy! Thanks to everybody involved in putting on the event today. No doubt there will be many photos surface of today but I'll drop in here one from Ben of the railbus waiting to go on this evening's special next to the Derby Lightweight power car which is under restoration. Another sunny day which saw the PWay team working around the 137mp area. This is the area close to where a large tree was removed recently requiring the rebuild of a catch pit. Today they worked on the track cant which had seemingly adopted a similar position to an adverse camber on the road, creating a twist. The S&T dept were on site at Shottle today preparing the area for the signalbox to be sited. This is the former Oddingley crossing box remember. It is likely that some of the concrete blocks that were donated by a local firm last year will come in very useful for this project. The Maintenance Team were in full flow today too with one arm preparing the DMUs for the Multiple Memories gala this weekend (mostly washing bodysides and the like) whilst the other began checking over running gear on the coaches for their starring role at the Bank Holiday Weekend. A gloriously sunny day in the valley. It was a slow start but it turned into a reasonable day in the end. People enjoyed sitting on the platform in the sunshine, eating ice cream. In the shed, work continued on sealing the roof of the Derby Lightweight trailer car. It has the usual Derby aluminium roof problem where the rivets pop off as they age which creates leaks. The BSK Kitchen car had the decorative body side lining painted and the numbers applied. It was a quieter day than previous weekends that resulted in us having moderate loadings on the Wirksworth Duffield service throughout the day. The Ravenstor steam service again proved popular as did the miniature railway, especially with our younger visitors. Down the yard Both LMSCA and Duke Restoration Team continued on their respective projects and there was a flurry of activity by the DMU group as they prepared for next weekend's gala. 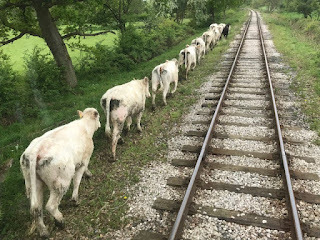 The DMU Train Crew had to cope with repeat animal ingresses on the line including a well behaved herd of cows near Duffield Meadows. Today's service was supported by the EVRA shop, Station Cafe and Booking Hall Staff. Today we hosted a Bronze Drive a Diesel Experience for three lucky participants, including one gentleman formerly of Old Oak Common who had a memory of driving first generation units from years ago. They all enjoyed a run out on Iris this morning before taking the 33 for a spin this afternoon. They enjoyed an enormous lunch in the station cafe too. Down the yard a shunt of the shed area was undertaken and the Class 08 had generator contact tips adjusted and replaced where necessary. We also launched a couple of new on train dining experiences for the summer season which includes Cream Teas on Saturdays and Ploughman's lunches on Sundays. Check out www.e-v-r.com/dining for more details. 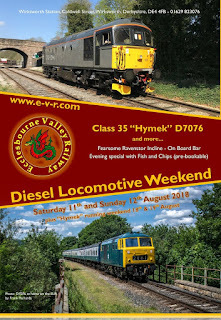 I also attach our first poster for the August Diesel Weekend. We are still sorting out of loco line up and it promises to be an exciting event! Not quite as warm as at the start of the work but still a pleasant sunny day. The PWay team were able to trip the works train back to Shottle this morning, including a very special cargo! A shelter for Shottle South Groundframe. I would like to hope the chances of snow during next weekend's Multiple Memories Railcar Gala are very slim but at least if it rains the signalman can keep dry. Today's testing customer from Scotland wrapped up their work testing a very strange machine. Who knows what it did but it looked cool. The Maintenance Team continued to ready the DMU fleet for the gala, including making good use of the new-found abundance of water to steam clean the underframes of the units. Work continues on the BSK Kitchen car and also the Mk2 TSO to prepare them for service in a few weeks time. A beautifully hot and sunny Bank Holiday, quite unbelievable really! The day has been littered with mild surprise as to the power of the water supply so thank you to everyone who assisted with it's upgrade this last week. Average loadings on the trains today. It hasn't been the worst Bank Holiday we have ever had, probably somewhere near the middle. It was supported by a very hot steam footplate and our heritage railcar service. Down the yard, the Maintenance Team worked on the intermittent fault with the vaccuum cylinder on 55006 and positioned some vehicles ready for DMU Gala prep. The event is approaching fast! A team worked on the Class 73 to assist with it's (hopefully) speedy return to service. The vacuum exhausters were fired up for the first time in preservation. The vacuum system was removed when the locomotive was converted to a Gatwick Express loco. The owners had refitted it but never got it working, due to a wiring issue which was discovered. Work continued on the BSK kitchen car ready for the new system. It seems remarkable to think a mere seven weeks ago we were driving through snow drifts to our Diesel Gala, today couldn't have been any more different and the change is very welcome. 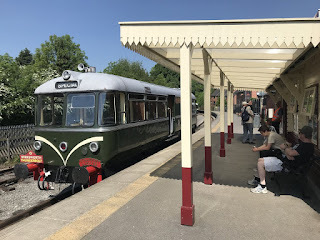 Our Duffield service ran to the green timetable with the three car set making four trips to Duffield with good passengers numbers on each. Back at Wirksworth the steam team operated on the incline and the miniature railway, bookshop and buffet were all open for business. Out of sight from the travelling public much activity was taking place across the yard and in the shed. Varnish was being applied to carriages, paint was being applied to DMU parts, seals were being applied to windows and steam was being applied to the underside of the Bubble car to clean it in preparation for more maintenance on this vehicle in the coming weeks. 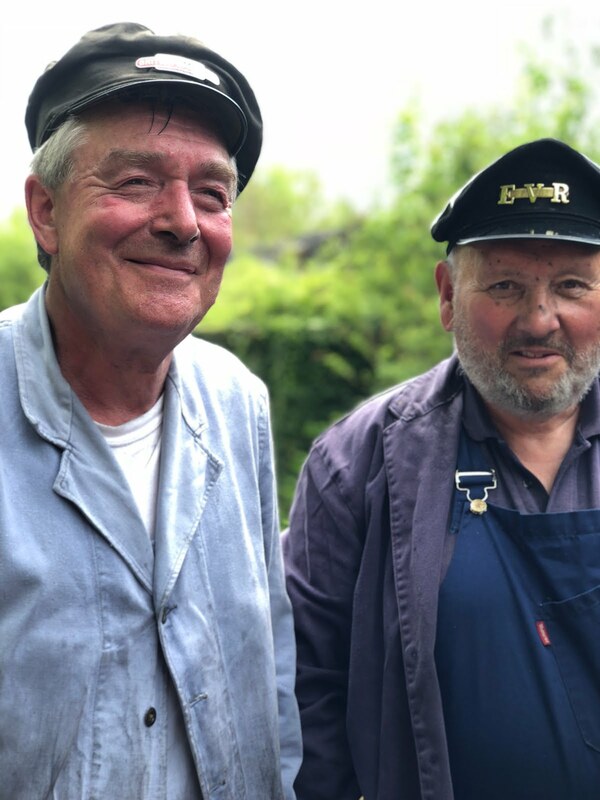 John welcomed two potential new volunteers who travelled on the Duffield service and latterly on one of many yard tours to illustrate the extent of our operation, we look forward to welcoming them to our railway in the foreseeable future. As Tom commented yesterday it seems the migration to our new email platform has completed successfully, you will see links on all received emails to modify your preferences or indeed to remove your subscription should you wish to but we hope this will provide a stable platform for communications for the future. My thanks to everyone who helped us with another successful day, I leave you Iris shining in the sun all against clear blue skies. Welcome back! After months of problems with unreliable distribution of email by the Yahoo group we have a new host. Thanks to the skills and expertise of Pete Watts the group history and as many email addresses as possible have been ported across to our new home. The data is now safe and it offers railway historians a rich resource of information on the remarkable growth of our wonderful railway. 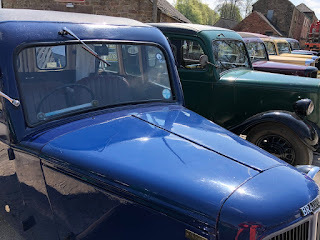 Today the Ecclesbourne Valley basked in beautiful sunshine which brought out many visitors to the railway. At Wirksworth we hosted a visit from the Jowett Car Club who took pride in displaying their carefully restored vehicles which were made in Bradford. The three car DMU service to Duffield ably coped with passenger numbers. On the incline the train crew facilitated a footplate experience before providing a scheduled steam service which was popular with our visitors throughout the day. Both station shops ran short of ice cream as the day progressed and our catering staff were kept busy replenishing stocks. Down the yard both the LMSCA and the Duke's restoration team were busy on their respective projects. Today's service was supported by the EVRA shop, miniature railway, booking hall staff and the catering team in the Station Cafe. My thanks to all the volunteers and staff who gave up their bank holiday Saturday to ensure our visitors were well looked after and received our customary friendly welcome.